A Magnum Opus - Sowing Happiness launches T-shirts for Men. Sowing happiness launches unique, sturdy and customized t-shirts of copious designs which suit up to everyone's closet. NEW DELHI, DELHI, INDIA, July 5, 2018 /EINPresswire.com/ -- Fashion is significant. It is life intensifying, and like everything that gives contentment, it is worth doing aptly. The fashion industry is making a quantum jump each year with upward sloping modernization and ever-changing predilection. Fashion is the next brook; sempiternal. There are plenty of styles for each season but this summer season t-shirts are the trendsetters. They are irresistible, and a must have for everyone, consequently sowing happiness has come up with some cool, funky and up to the minute t-shirts. From Bollywood celebs to teenagers and youngsters everyone is going nutty over these personalized t-shirts and making their own style statement. Glamour is making folks their own fashionista. People are not only cramped to penny plain t-shirts. They are the prevalent thread garb in this modern world, indubitably emanating out as a fashion trope. They are summer's most cherished and wanted garment that conveys individual style. Earlier in 1950's t-shirts were used as an undergarment and then with growing modernism were contemplated as casual garb and now it is pervasive and entrenched in our society. They are the new in-thing, and a must-have for everyone t-shirts are a chunk of our modern life whereas customized t-shirts which are used as a means of personal expression can be sarcastic, funny, racial, and ironic and can gladden the crowd. Swag is the new fad! Who wants to slog the Galleria, when you can become your own fashionista at home, sowing happiness has launched a range of customized t-shirts for men. Their t-shirts are setting up a new cult in the market. Showing happiness's custom-made designer t-shirts are the best medium that depicts your fashion statement, they are the way to say, and who you are without having to speak. They vend trendy t-shirts available in super soft colors and comfy fabric at very decent prices. 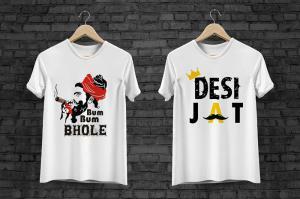 Desi Jat can learn without pain, and desi swag t-shirts are already becoming crowd's favorite and gaining momentum. Also sowing happiness is every time ready to shake hands with corporates. It is the best place for corporate customized and promotional t-shirts, they offer both affordable and powerful logo t-shirts. Dealing in different sort of designer products made on order for a particular customer, they are adding new products daily to their site which would be a quick add to the cart.